The objective of the 2015 EDC (Export Development Canada) Corporate Annual Report was to clearly and concisely tell the EDC story by spelling out what was done in 2015. In addition, EDC wanted to put a ‘human face’ to their business so that readers would better understand what they do and why they do it. EDC wanted to develop an Annual Report design that complements the story it had to tell. This was done primarily through customer anecdotes. Given current industry trends, Industrial recommended adopting online Annual Report practices, making it easier to consume for online audiences. This implementation involved developing a new Annual Report website with a new look and feel (initiated by the print publication) that highlighted the theme and messaging from the report, while introducing the use of modern digital media and user experience design. The intention of this implementation was to build a template that could be re-populated year after year, introducing a cost ratio benefit after the first year of production. In this implementation, the Annual Report’s full financial data will be migrated from print to HTML format. 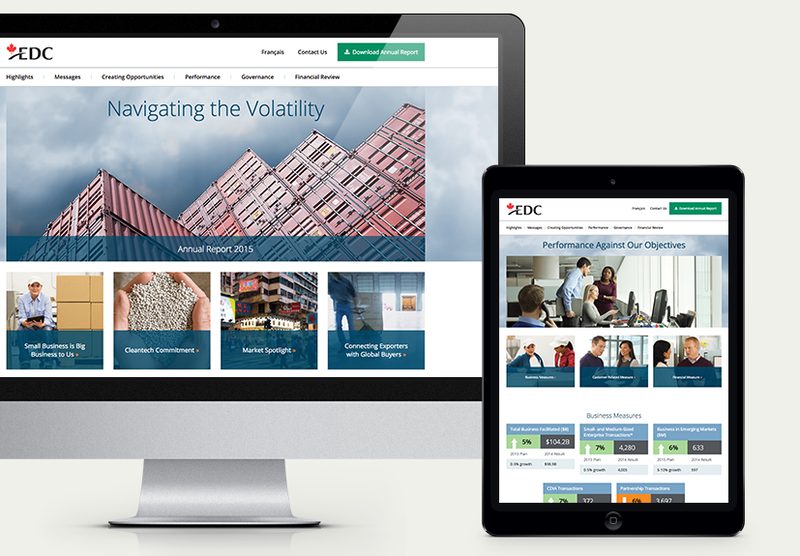 The challenge was to produce a visually compelling corporate online annual report that focused attention to reports with extensive financial performance information. By presenting a high-level of the Annual Report it created a modern user experience where the reader could scan and consume content easily, taking deeper dives into the detail as they need. This increased the overall accessibility of the report and the likelihood that the intended audience would consume it. A visually appealing experience, with reduced amounts of text, communicated quickly and clearly. A high-level version also decreased the amount of data to be loaded, making it more likely that mobile users would navigate through the report.